I wish to sing of my interior visions with the naïve candour of a child. No doubt, this simple musical grammar will jar on some people. It is bound to offend the partisans of deceit and artifice. I foresee that and rejoice at it. 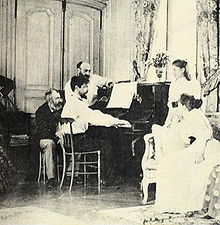 Achille-Claude Debussy (22 August 1862 – 25 March 1918) was a French composer, prominent in the style commonly referred to as Impressionist music, though he himself intensely disliked the term. I confess that I am no longer thinking in musical terms, or at least not much, even though I believe with all my heart that Music remains for all time the finest means of expression we have. It’s just that I find the actual pieces — whether they’re old or modern, which is in any case merely a matter of dates — so totally poverty-stricken, manifesting an inability to see beyond the work-table. They smell of the lamp, not of the sun. And then, overshadowing everything, there’s the desire to amaze one’s colleagues with arresting harmonies, quite unnecessary for the most part. In short, these days especially, music is devoid of emotional impact. I feel that, without descending to the level of the gossip column or the novel, it should be possible to solve the problem somehow. There’s no need either for music to make people think! … It would be enough if music could make people listen, despite themselves and despite their petty mundane troubles, and never mind if they’re incapable of expressing anything resembling an opinion. It would be enough if they could no longer recognize their own grey, dull faces, if they felt that for a moment they had been dreaming of an imaginary country, that’s to say, one that can’t be found on the map. The worship of Adonis is united with that of Christ. Collect impressions. Don’t be in a hurry to write them down. Because that’s something music can do better than painting: it can centralise variations of colour and light within a single picture — a truth generally ignored, obvious as it is. On the tale of Saint Sebastian, as told by Gabriele d'Annunzio in the play Le martyre de St. Sébastien (1911), for which he wrote the music, as quoted in Claude Debussy: His Life and Works (1933) by Léon Vallas, p. 225. Shortly before its opening, the Archbishop of Paris declared the work offensive to Christian consciences, and forbid French Catholics to attend upon pain of excommunication. Do you really think that my music is devoid of religious antecedents? Do you wish to put an artist's soul under restraint? Do you find it difficult to conceive that one who sees mystery in everything — in the song of the sea, in the curve of the horizon, in the wind and in the call of the birds — should have been attracted to a religious subject? I have no profession of faith to utter to you: but, whichever my creed may be, no great effort on my part was needed to raise me to the height of d'Annunzio's mysticism. I can assure you that my music was written in exactly the spirit as if it had been commissioned for performance in church. Have I succeeded in expressing all that I felt? It is for others to decide. Is the faith which my music expresses orthodox? I do not know; but I can say that it is my own, expressed in all sincerity. I do not practise religion in accordance with the sacred rites. I have made mysterious Nature my religion. I do not believe that a man is any nearer to God for being clad in priestly garments, nor that one place in a town is better adapted to meditation than another. When I gaze at a sunset sky and spend hours contemplating its marvelous ever-changing beauty, an extraordinary emotion overwhelms me. Nature in all its vastness is truthfully reflected in my sincere though feeble soul. Around me are the trees stretching up their branches to the skies, the perfumed flowers gladdening the meadow, the gentle grass-carpetted earth, … and my hands unconsciously assume an attitude of adoration. … To feel the supreme and moving beauty of the spectacle to which Nature invites her ephemeral guests! … that is what I call prayer. Variant translation: Before the passing sky, in long hours of contemplation of its magnificent and ever-changing beauty, I am seized by an incomparable emotion. The whole expanse of nature is reflected in my own sincere and feeble soul. Around me the branches of trees reach out toward the firmament, here are sweet-scented flowers smiling in the meadow, here the soft earth is carpeted with sweet herbs. … Nature invites its ephemeral and trembling travelers to experience these wonderful and disturbing spectacles — that is what I call prayer. I wish to write down my musical dreams in a spirit of utter self-detachment. I wish to sing of my interior visions with the naïve candour of a child. No doubt, this simple musical grammar will jar on some people. It is bound to offend the partisans of deceit and artifice. I foresee that and rejoice at it. I shall do nothing to create adversaries, but neither shall I do anything to turn enmities into friendships. I must endeavour to be a great artist so that I may dare to be myself and suffer for my faith. Those who feel as I do will only appreciate me more. The others will shun and hate me. I shall make no effort to appease them. On that distant day — I trust it is still very far off — when I shall no longer be a cause of strife, I shall feel bitter self-reproach. For that odious hypocrisy which enables one to please all mankind will inevitably have prevailed in those last works. Is it not our duty to find the symphonic formula which fits our time, one which progress, daring and modern victory demand? Variant translation: The attraction of the virtuoso for the public is very like that of the circus for the crowd. There is always the hope that something dangerous might happen. As there are no precedents, I must create anew. Music should humbly seek to please; within these limits great beauty may perhaps be found. Extreme complication is contrary to art. Beauty must appeal to the senses, must provide us with immediate enjoyment, must impress us or insinuate itself into us without any effort on our part. Is it not our duty to find the symphonic formula which fits our time, one which progress, daring and modern victory demand? The century of airplanes has a right to its own music. Variant: The century of aeroplanes deserves its own music. As there are no precedents, I must create anew. People don't very much like things that are beautiful — they are so far from their nasty little minds. Unsourced variant: There is no theory. You have only to listen. Fantasy is the law. Composers aren't daring enough. They're afraid of that sacred idol called "common sense", which is the most dreadful thing I know — after all, it's no more than a religion founded to excuse the ubiquity of imbeciles! Music would take over at the point at which words become powerless, with the one and only object of expressing that which nothing but music could express. For this, I need a text by a poet who, resorting to discreet suggestion rather than full statement, will enable me to graft my dream upon his dream — who will give me plain human beings in a setting belonging to no particular period or country. … Then I do not wish my music to drown the words, nor to delay the course of the action. I want no purely musical developments which are not called for inevitably by the text. In opera there is always too much singing. Music should be as swift and mobile as the words themselves. Unsourced variant: Works of art make rules; rules do not make works of art. Music is a mysterious mathematical process whose elements are part of Infinity. … There is nothing more musical than a sunset. He who feels what he sees will find no more beautiful example of development in all that book which, alas, musicians read but too little — the book of Nature. What I am trying to do is something different — an effect of reality, but what some fools call Impressionism, a term that is usually misapplied, especially by the critics who don't hesitate to apply it to Turner, the greatest creator of mysterious effects in the whole world of art. As quoted in Turning Numbers into Knowledge: Mastering the Art of Problem Solving (2001) by Jonathan G. Koomey, p. 96; since at least 2010 similar statements are also sometimes attributed to Mozart, and a similar remark, apparently one of Ben Jonson, is quoted in "Notes to Cynthia's Revels, in The Works of Ben Jonson: With Notes Critical and Explanatory, and a Biographical Memoir (1875), edited by William Gifford, Vol. 2, in notes to p. 223, on p. 551: Division, in music, is "the space between the notes of music, or the dividing of the tones." The music is not in the notes, but in the silence between them. It is necessary to abandon yourself completely, and let the music do as it will with you. All people come to music to seek oblivion. Art is the most beautiful deception of all! And although people try to incorporate the everyday events of life in it, we must hope that it will remain a deception lest it become a utilitarian thing, sad as a factory. … Let us not disillusion anyone by bringing too much reality into the dream. Unsourced variant: Art is the most beautiful of all lies. I believe the principle fault of the majority of writers and artists is having neither the will nor the courage to break with their successes, failing to seek new paths and give birth to new ideas. Most of them produce them twice, three, even four times. They have neither the courage nor the temerity to leave what is certain for what is uncertain. There is, however, no greater pleasure than going into the depth of oneself, setting one's whole being in motion and seeking for new and hidden treasures. What a joy to find something new in oneself, something that surprises even ourselves, filling us with warmth. I love Italian opera — it’s so reckless. Damn Richard Wagner, and his bellowings at Fate and death. Damn Debussy, and his averted face. I like the Italians who run all on impulse, and don’t care about their immortal souls, and don’t worry about the ultimate. An examination of the harmonic techniques out of their context has all too often led to misleading terminology such as 'static' or 'non-functional' as a description of Debussy's harmonic methods. Viewed as a whole, however, the tonal coherence of his music depends upon a carefully calculated and often dramatic interaction of these various harmonic 'types' with each other and with orthodox diatonic harmony. The result is a tonal language, but one which is fundamentally different in concept from classical tonality. The detailed classifications of harmonic events is no longer possible in Debussy's music where the central tonality of a work emerges only through a constant focusing and re-focusing on harmonic types. The Sea of Debussy does not call for many words of comment. The three parts of which it is composed are entitled From Dawn till Noon, Play of the Waves and Dialogue of the Wind and the Sea, but as far as any pictorial suggestiveness is concerned, they might as well have been entitled On the Flatiron Building, Slumming in the Bowery and A Glimpse of Chinatown During a Raid. Debussy's music is the dreariest kind of rubbish. Does anybody for a moment doubt that Debussy would not write such chaotic, meaningless, cacophonous, ungrammatical stuff, if he could invent a melody?... Even his orchestration is not particularly remarkable. 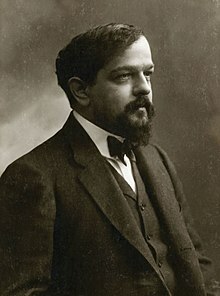 Among all our musical masters, l should say, Claude Debussy was the least weighed upon by the dead hand of formula. Yet neither was he an improviser. This latter art, indeed, among all the compositional techniques, is the one most servile to rules of thumb. Debussy's operation was more thorough. Like any Frenchman building a bridge or cooking a meal, painting a picture or laying out a garden, he felt, he imagined, he reasoned, he constructed—and in that order. This page was last edited on 24 January 2019, at 17:59.